All that art gallery controversy (ongoing) and a week of wanderings both literally and virtually around Layerthorpe, and I’m feeling quite tired. Let’s have a sit down on a bench in a nice park, perhaps in the olden days, in simpler times. 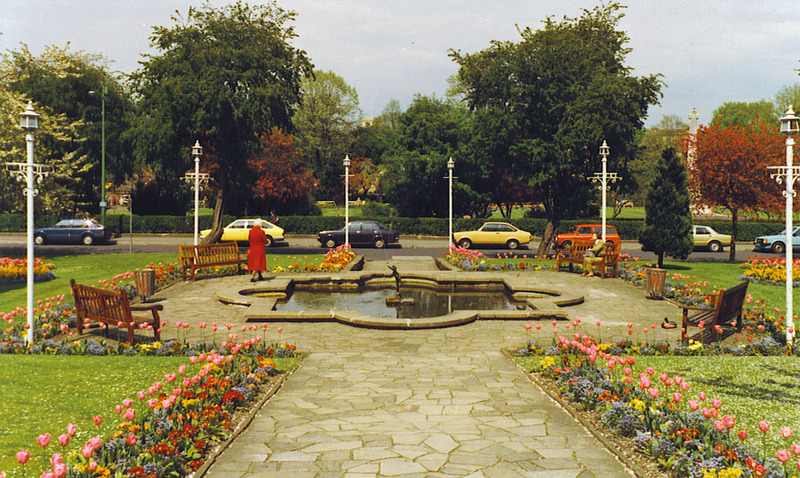 Like this park, here, in 1983. 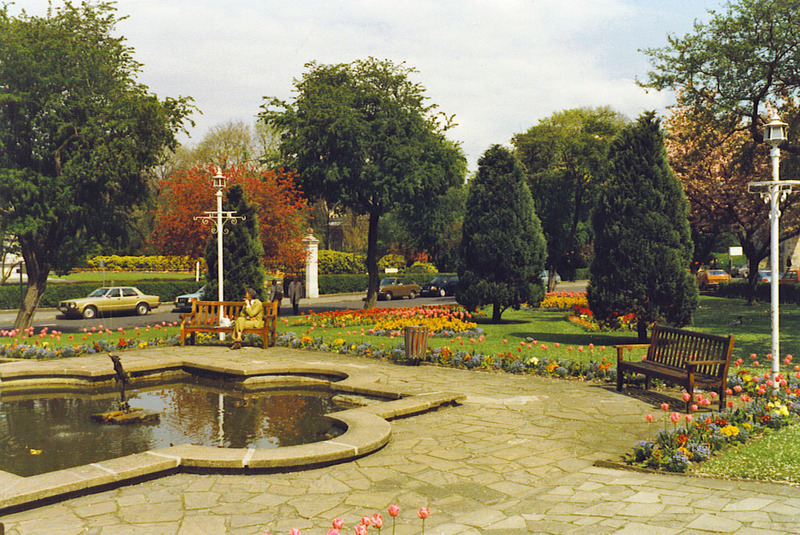 It’s the small area of formal garden near the station, just across from the Memorial Gardens. 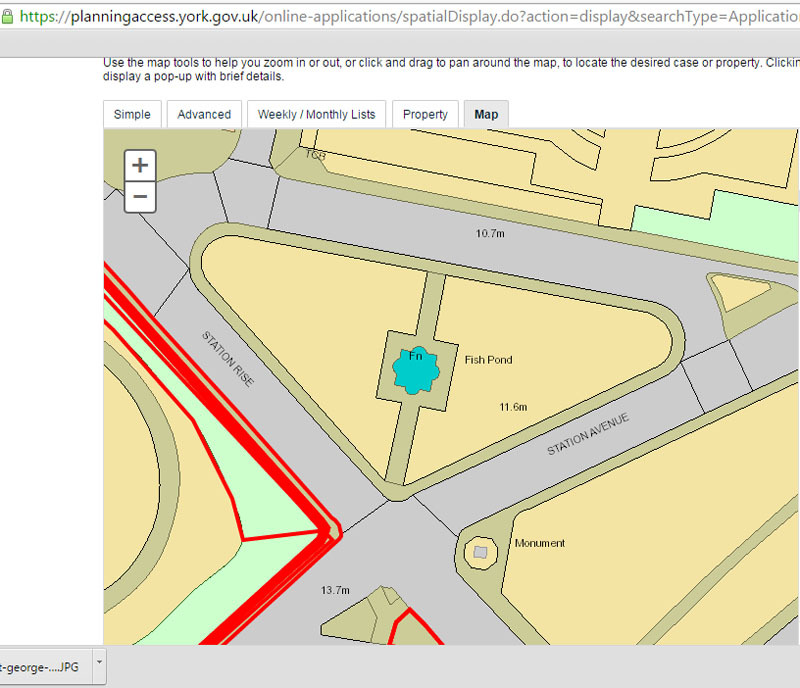 Here’s a map of it from the council website showing the formal pool which is (or was) a ‘Fish Pond’. Apparently this area is called ‘Triangular Gardens’, according to a recent council press release. I didn’t know it had a name, and if I was referring to it at all, which I can’t imagine I would, I’d call it ‘that bit of park between the roads near the station. You know, kind of triangular.’ I couldn’t find any evidence that ‘Triangular Gardens’ has been widely adopted as a name. But then perhaps the Triangular Gardens is one of those generally overlooked and unappreciated places, somewhere we just walk through or round and barely notice. Like many park areas and shrubberies looked after by the council it has been rather cut back, because of cutbacks. And perhaps changes in tastes and priorities. 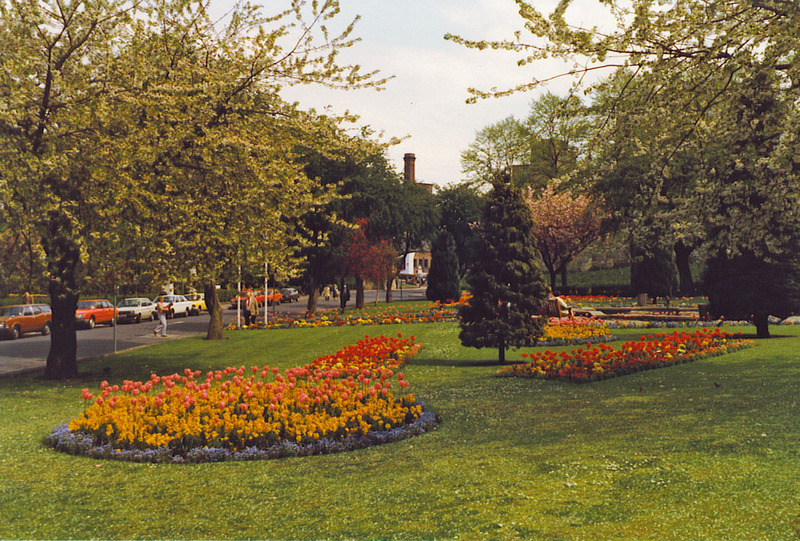 In 1983 it was full of spring-flowering bedding, had more flowerbeds, and more benches and bins. 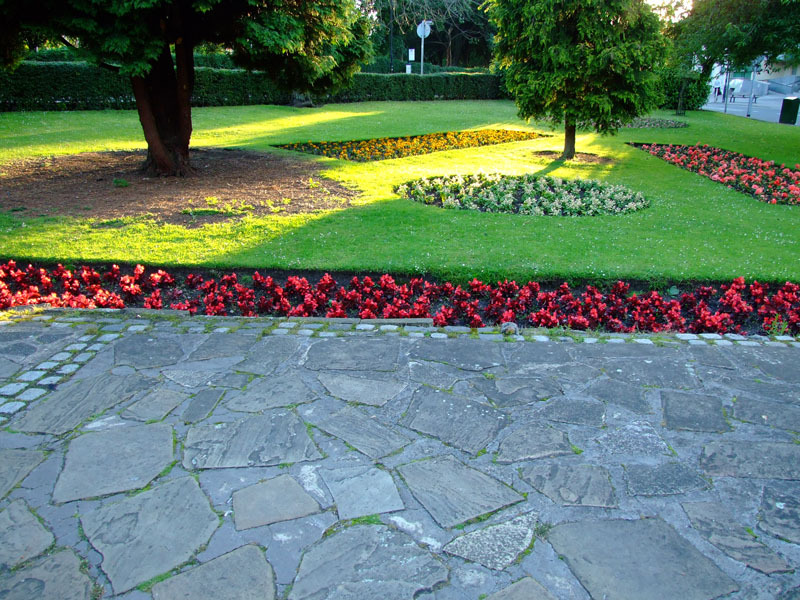 Look at the first photo, how the benches and bins are arranged formally, to match the symmetry of the garden layout. I’ve not generally taken much notice of this garden, except for one evening in June in 2007 when I’d been out taking photos and passed it on my way home, when it was looking rather nice in the evening light. 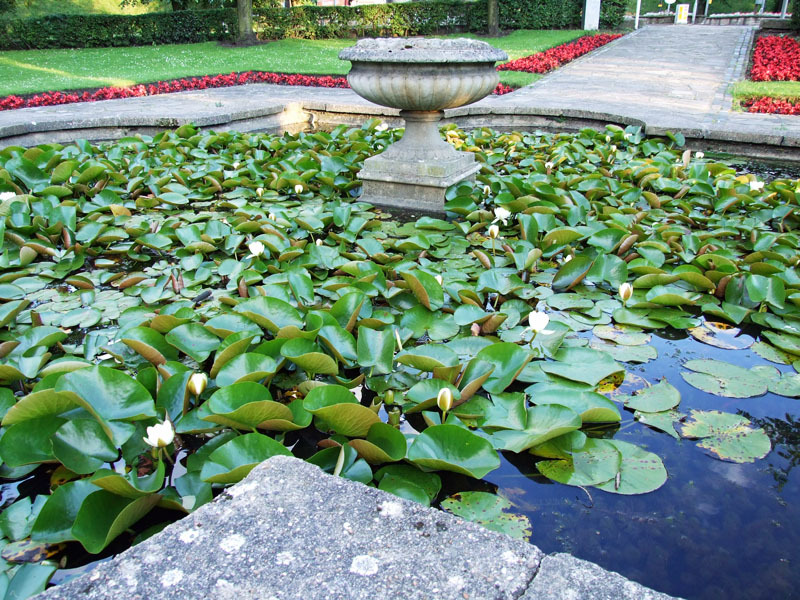 In the intervening 24 years an urn had replaced what appears to have been a small statue or metal figure in the pond’s centre. 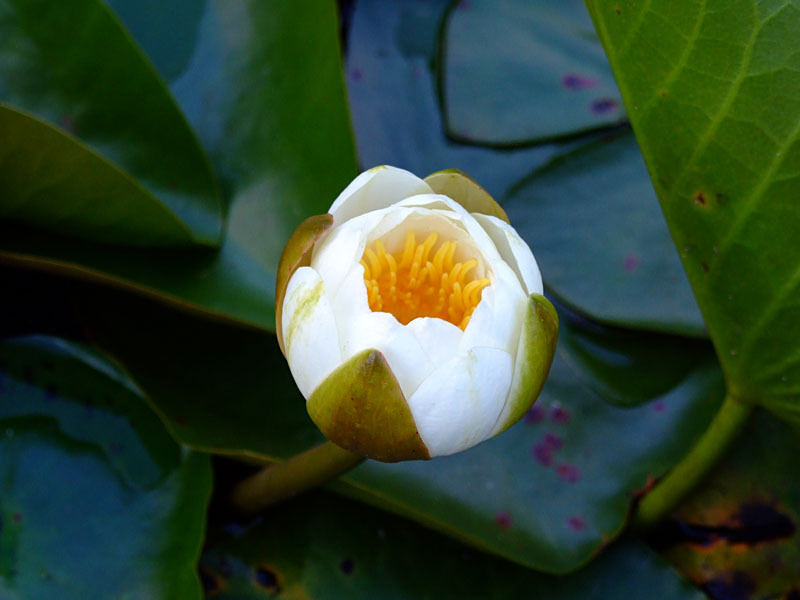 Around it, the waterlilies were thriving. The four benches and two bins thought necessary in 1983 have now been reduced to no benches and no bins. This park is no longer somewhere you’re meant to linger. The ornate white-painted lights placed in symmetrical fashion have been reduced to a few, with one randomly left in one corner of the central square. 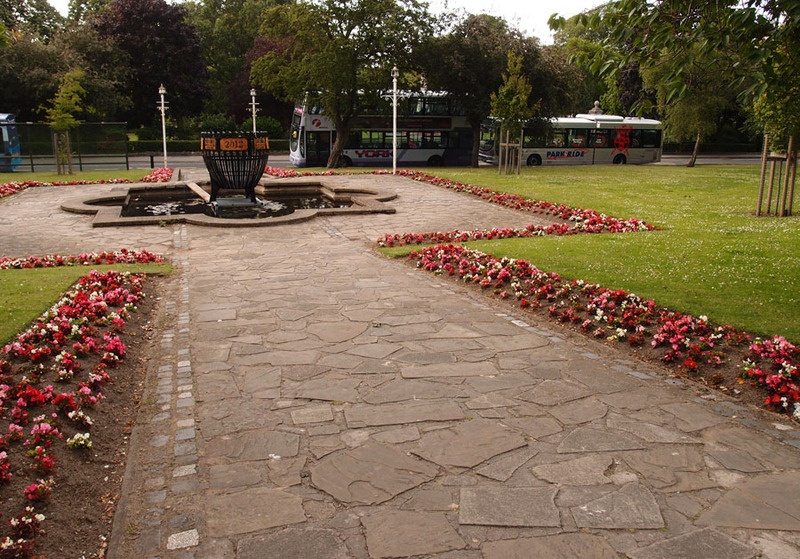 Not visible on the photo above and perhaps something that’s gone generally unnoticed is a reduction in the flowerbed area, as the ones in the grass have been removed, and the areas turfed over. The Google Street View images (see ‘More’, below) suggest that this has happened at some point in the last three years. There are still annual plants planted in formal fashion in the narrow beds alongside the paths, but I wonder why. Clearly these formal bedding schemes cost money to make and maintain, and aren’t essential. The crazy paving remains. So fashionable at one time, so unfashionable now, but in places a nice reminder of a particular phase in our thoughts about what looked good in garden areas. And the paths made from it form a handy cut through across this triangle of land, though the pool in the centre kind of gets in the way. Once a focal point, now an obstruction. 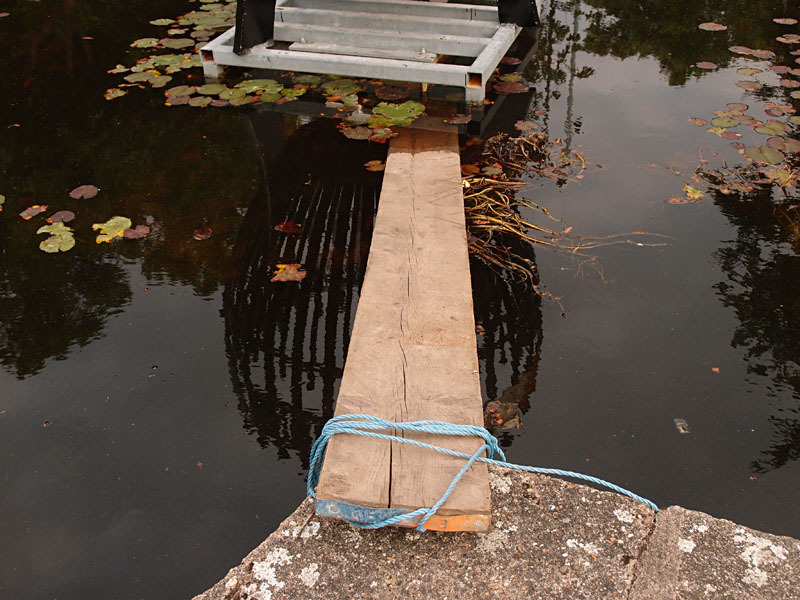 I visited recently, a few weeks back, as mentions on Twitter had drawn my attention to a plank in the central pool which I believe was put there to assist ducklings in getting out of the pool should they get in. These formal pools with straight sides and overhanging paving round the edge aren’t wildlife friendly. Not really working that well, this garden, is it. The pool didn’t look like it had any fish in it, if it ever did. The water lilies looked a bit feeble and the pool looked clogged and grubby, with litter floating in it. In the middle of a grassy triangle between roads. Not somewhere you’d want to linger. And if you did, you’d have to sit on the floor. The fire basket is a handsome thing, but I was surprised to see it was still there in mid-July, two months later. The passing visitor, seeing the 2012 date, would assume that this rather charred fire basket has been here for three years. That we haven’t quite got around to removing it. Or perhaps that it’s now the garden’s centrepiece. I heard that there may be plans to fill in the formal pool. It may have already been done. It seems like a sensible idea, though as the removal of elements of our streetscape can be controversial some public consultation might be a good idea too. Perhaps the whole garden needs a rethink, and we could have wildflowers or one of the Edible York beds instead. Perhaps the pool could be turned into a big bed of veg. But I hope that crazy crazy paving is preserved, as a period feature. Anyway, as there are no benches in the place these days let’s wander off and look for somewhere else to sit down. Google Street View has captured images of the gardens in recent years — see Google Street View, May 2012 and move the slider for images from other years. 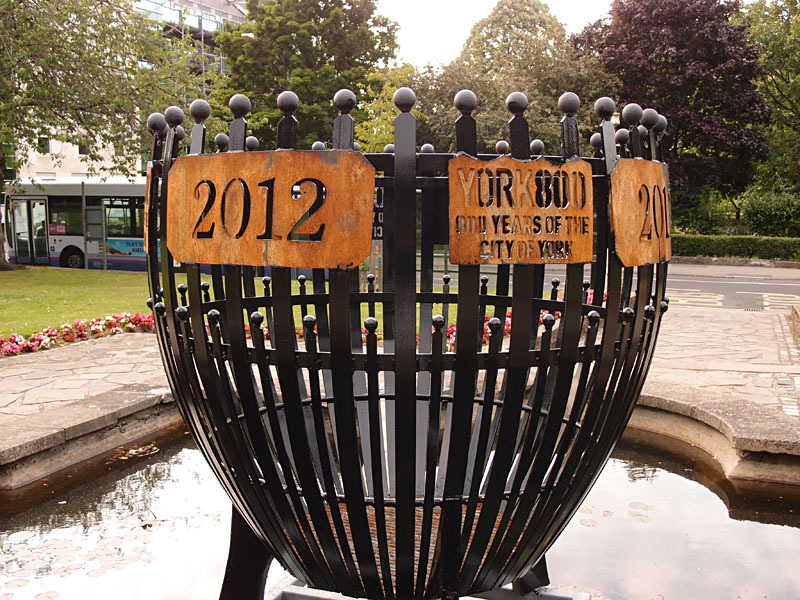 By Lisa @YorkStories • 5 August 2015 Details, Green places To link to this page's proper location please use the > permalink. Walked past so many times and never really taken any notice of it until now. Seems crazy to remove the benches. What positive effect can that have? It you look closely you can see that the crazy paving has at some point been re-laid and sits a bit higher than previously judging by the gap under the pond surround. I think you’re right Graham that it must have been relaid, just noticed that the crazy paving now includes lines of square setts at its edges, not there on the 1980s photos.